…but looking back, I’m really unhappy with Part 4. Xcode5 invalidates almost 30% of it, and the remainder wasn’t practical – it was code-cleanup. So, I’m going to try again, and do it better this time. This replaces my previous Part 4 – call it “4b”. As explained in Part 2 … OpenGL doesn’t work that way. Instead, for each item, you need to go through the complete setup and tear-down of every configurable parameter that might affect the drawing. Under the hood, most windowing API’s do this too – but they hide it from you. We’ll create multiple triangles, each with their own unique geometry, and display them all at once. I deliberately avoided going into detail on VAO (Vertex Array Objects) vs. VBO (Vertex Buffer Objects) until now. Note that “VAO” and “VBO” are independent: you can have multiple VAO’s sharing 1 VBO. You can have 1 VAO using multiple VBO’s. And any combination of many-to-many. But a Draw call only ever uses a single VAO. A single VAO is mapping “a bunch of metadata, plus a big chunk of VRAM on the GPU … to a single draw-call”. It’s important to understand that a VBO “is” a BO. Everything you can do with a VBO you can also do with any BO. We give it a different name because to us, as programmers, it’s easier to think about that way. There is one caveat: the GPU is allowed to do under-the-hood optimizations based on what you first use a BO for. In practice: you’ll rarely need to re-use a buffer for a different purpose, so don’t worry about it. With a generic BO (BufferObject), some of the method calls in OpenGL will require a “type” parameter. Whenever you pass-in the type “GL_ARRAY_BUFFER”, you have told OpenGL to use that BO “as a VBO”; it has no special meaning beyond that. Vertex Buffer Objects: why plural? A BufferObject is simply a big array stored on the GPU, so that the GPU doesn’t have to keep asking for the data from system-RAM. RAM -> GPU transfer speeds are much slower than GPU-local-RAM (known as VRAM) -> GPU upload speeds. As soon as you have BufferObjects, your GPU has to start doing memory-management on them. GPU’s are OK at this, but not great – it’s a complex problem and requires a lot of code and theory at the level of “building a new Operating System”. With poor hardware you can get noticeable speed gains by having “only one” VBO for your entire app and doing your own memory-management on its contents. It’s messy in code / debugging terms (no isolation of data), but sometimes worth it. On the flip-side … GPU’s have lots of gotchas to do with “replacing” the data inside an existing BO/VBO. OpenGL is hiding the multi-threaded reality from you – but when you write to the GPU’s local VRAM, from CPU, it’s easy to get “blocked” waiting for the render threads to complete. This is a particular problem on PVR, as used in all iOS devices. This affects dynamic data in your app – but also simple stuff like running out of memory: if you only have one VBO, you’re screwed. You can’t “unload a bit of it to make more room” – a VBO is, by definition, all-or-nothing. You have to dump the whole thing, then re-upload a subset of it. Taken all together … the sweet-spot for OpenGL ES 2 on iOS is somewhere around “slightly more than 1 VBO dedicated to each VAO”. We have our standard “glName” (everything has one), and we have a glBufferType, which is set to GL_ARRAY_BUFFER whenever we want the BO to become a VBO. The first two lines create a BO/VBO, and store its name. From now on, we’ll automatically set the “GL_ARRAY_BUFFER” argument using our self.glBufferType. Looking at that last line, the second-to-last argument is obviously “the array of data we created on the CPU, and want to upload to the GPU”. … but what’s the second argument? A hardcoded “3 * (something)”? In our case, we were uploading 3 vertices (one for each corner of a triangle), and each vertex was defined using GLKVector3. The C function “sizeof” measures “how many bytes does a particular type use-up when in memory?”. The 2nd argument there is also called “size” – but it’s a different number. 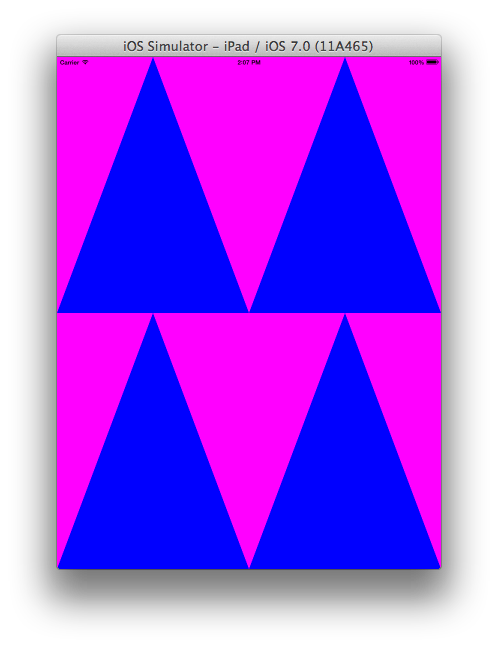 glDrawArrays( GL_TRIANGLES, 0, 3); // this 3 is NOT THE SAME AS PREVIOUS 3 ! The final one – glDrawArrays (how many vertices to “draw”) – we’ll store in the GLK2DrawCall class itself, but the rest needs to be associated with the VBO itself, and make sure we use the right kind of “size” at each moment. Earlier, I stated that you can put “all” your data for a draw-call into a single VBO. So far, we filled a single VBO with values for a single Attribute. There are many cases where that’s the right approach (one VBO contains data for one attribute) – but your starting point for a new 3D object is to cram all data, for all its Attributes, into one VBO. This method is IMHO one of the worst-designed ones in the OpenGL API. When newbie OpenGL programmers screw-up and can’t work out what’s gone wrong, it’s usually a misunderstanding of the arguments of this method. This is often made worse because tutorials put “0″ and “GL_FALSE” into the arguments, and don’t explain why. “number of components per generic vertex attribute. Must be 1, 2, 3, 4″ — i.e. if your shader source code had this attribute as a “vec4″, you MUST set this to “4″. If it had a “vec2″, it would be “2″. For a simple float: “1″. “specifies whether fixed-point data values should be normalized (GL_TRUE) or converted directly as fixed-point values (GL_FALSE)” — in this case, they mean “are you weird, you’re sending me the wrong data, and you want all your values to be converted into the range (0…1)?, or shall I just use the data you gave me?”. Hence: always GL_FALSE. “the byte offset between consecutive generic vertex attributes” — Aha. Interesting. “offset of the first component of the first generic vertex attribute in the array” — Hmm. Interesting. If you only have one “vertex attribute” in the array … then the “offset between” them will be the size of the attribute in bytes (i.e. “read one attribute. Then move ahead “the size of one attribute”, and read the next). But OpenGL allows a pointless optimization here which only confuses people: if you provide “0″, it magically works in the special case of “only one” attribute. …and with only one Attribute: your “offset” will be “0″ — i.e. “start at the start”. “offset of the first component” — the first Attribute starts at the start – 0. The second Attribute will have to skip ahead a little to find its first value. i.e. add together “size of one each of the Attributes that were before this one in the array”. Note how you can auto-convert data into those arrays using Apple’s new “@( … )” Objective-C autoboxing syntax – but when you extract them, you have to explicitly cast them to correct types. NSNumber does the magic for us, in both cases. VBO is now done, yay! But we still have to finish VAO – that glVertexAttribArray call needs cleaning up. The only special item here is “usage”. Previously, I used the value “GL_DYNAMIC_DRAW”, which doesn’t do anything specific, but warns OpenGL that we might choose to re-upload the contents of this buffer at some point in the future. More correctly, you have a bunch of different options for this “hint” – if you look at the full source on GitHub, you’ll see a convenience method and two typedef’s that handle this for you, and explain the different options. This is also a great time to point-out some sleight-of-hand I did last time. Anyone with sharp eyes will notice that I uploaded “vector3″ (data in the form: x,y,z) to an attribute of type “vector4″ (data in the form: x,y,z,w). And nothing went wrong. Huh? We told all of OpenGL “outside” the shader-program: this buffer contains Vector3′s! Each one has 3 floats! Note: That’s THREE! Not FOUR! …otherwise, I’d have had to define our triangle using 4 co-ordinates – and what the heck is the correct value of w anyway? Better not to even go there (for now). All of this “just works” thanks to the code we’ve written above, in this post. We explicitly tell OpenGL how to interpret the contents of a BufferObject even though the data may not be in the format the shader is expecting – and then OpenGL handles the rest for us automagically. Hang on – how come so little has changed? This is the purpose of VAO’s: they encapsulate (at the OpenGL / GPU level) all the data surrounding a bunch of VBO’s. That means “the raw values of the Attributes”, but also “the metadata about the VBO’s”. By modifying and re-writing and refactoring our VBO/BO/BufferFormat code … we have no effect on the rest of the app, only the VAO code needs to change. Next time – I promise – will be all about Textures and Texture Mapping. No … really!